Thanks to the internet, we can access many resauces to learn a language, and it also enables us to connect with people from all over the world. Do you use Skype to talk with a native speaker of your target language? I wish I can find someone who speaks Taiwanese, Persian or Dutch in my city, too! So, I'm going to write about Language Exchange as today's post. I've written about this topic several times and you can read them here. Let's take advantage of the internet technology! There're many websites which help you find a native speaker of your target language who's learning your language. I've introduced this website before in my blog, but their interface has changed. 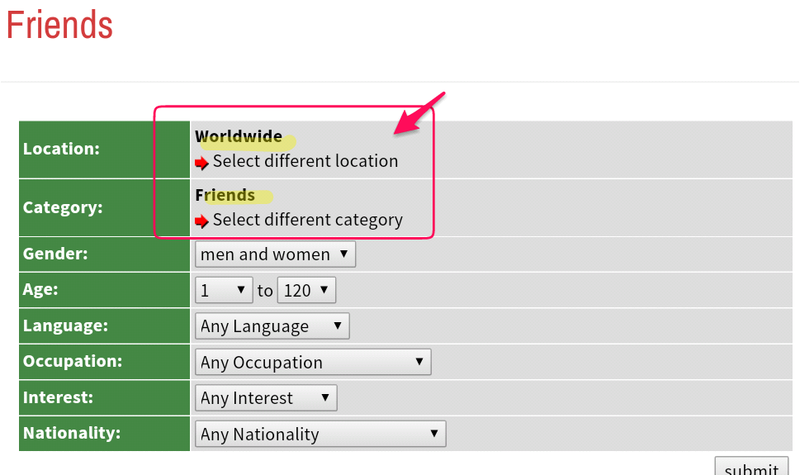 If you want to find a in-person conversation partner, select the location where you live. 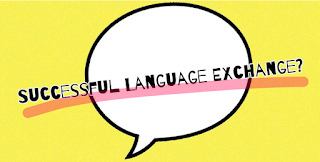 And I recommend you to choose "Language Exchange" category. 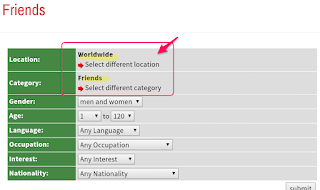 It's a very simple website to find a language exchange partner. I think there're many Japanese users, too. This is an app for language exchange. You can search people who live near you. It is mainly used for finding a free place to stay when you travel abroad, but you can also use it to find a native speaker who is interested in learning your language! I often hear people say that they could find a person but it never last for long. Does it depend on your luck whether if you can find an ideal language exchange partner? Well, it could be a luck ーwe call this kind of luck 縁(えん)/en/ by the wayー but I think at least there's something you can do to find a good partner and have a successful language exchange! First of all, put an ad or fill in the profile page of those language exchange websites. Not only browsing other people's ads. It would be better to write what/how you want to do in the language exchange. What is your level? Can you read or write in ひらがな/カタカナ? How about Kanji? Do you know basic grammar? If you're totally beginner, it would be easier for you to talk with people who are higher than elementary level in your language. If you want to have a regular practice, let them know that you're a motivated learner! How often do you want to have a session? Are you looking for a person who can meet and have a face-to-face conversation? Do you want to voice chat or text chat? What time would be convenient for you? Do you want to split time 50/50 like first 30 mins you guys can only speak in language A and the latter 30 mins switch to language B? Do you want to practice making sentences using your text book or talk about your daily life, or pick up several topics to talk about? Do you want him to correct your words as much as possible or is it okay if it makes sence and you can keep conversation? These are the things that I felt it very helpful through language exchange, and I also keep them in my mind when I talk with my partners. To have a good language exchange, you also should be a good partner for them! At first, I speak a little bit faster than they speak in Japanese (my native language = their target language). A little bit, though. This is because our speaking level is usually lower than comprehensive level. If it seems too fast to understand, I speak slower. If it takes a little while but she can understand what I say, I keep that speed in shorter and simpler sentences, unless she asks me to speak slower. It's so stressful if I couldn't catch any of words she spoke. I try to use very basic and frequent words and grammar if my partner is not at intermediate level yet. I don't like to check a dictionary or translater instantly. Instead, I try to explain the word in other words as much as possible. Both in the case when I don't know the exact word I want to express, and when my partner doesn't know what the certain word means. So our conversation doesn't move on quickly but I think it is a good practice. And the words which I struggled with remain in my mind easily. You know, it takes time to make a sentence in a foreign language especially when it comes to speaking. I feel very disappointed if I'm always interrupted while I'm thinking and trying to construct a sentence. Sometimes I need a help but I want to try by myself. So I try not to interrupt her, too. Even if I found a mistakes in her speech or it wasn't natural sentence, I listen to her at first. I can tell her correct words or better expression after she finish saying that sentence. I don't have to rush her. Though it is hard to tell whether she is trying to say something or just thinking about what to talk, especially when I can't see her face. This is one of the reasons why I prefer face-to-face conversation. Well, I hope you'll find a nice language exchange partner and have a good practice with him! :) That's all for today, thank you for reading. Feel free to leave your comments!